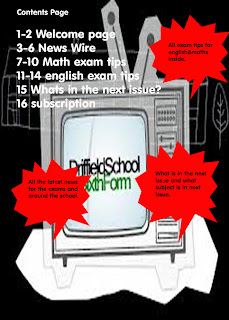 I chose the background of the school logo in the tv to keep it relevante but later i superimposed the picture on to the tv to work with my tagline "thinking outside the box"
I kept the colours simple because i did not want to waste time on choosing colours,they also outline important information such as the puff "free issue#1"
I directed the actor to look like he needs some exam tips and to make it fit with my thought bubble. 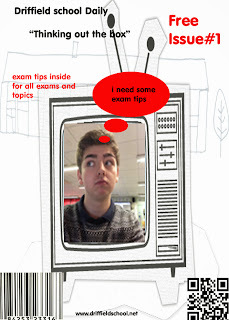 Also used the actors eyes to place where i would write on the front cover about the exam tips. I used the school website to enforce the fact that it is a school magazine and that students can find stuff on the website to do with the magazine such as questions and topics to discuss, the QR code is there so that they can skip straight to the webpage instead of going through the school website. For the contents page i chose to keep the background similar but changed the background to black for a change as i thought is would look better than my front cover.also i thought it looked better than my front cover. Once again i kept the colour scheme simple and the same colours as before, i changed the background from white to black whilst changing the writing from black to white so it was visable.Also keeping the speech bubbles red so that they stand out from the rest of the page. To keep it being a magazine i would have done sixteen pages as this is a small magazine in which i could still give alot of detail to the magazine. If i had to change somthing it would be to make the front cover the same as the contents page and maybe be more adventures.